We can have light-hearted conversations about some of these questions, for sure. But should we get into arguments over them? Or write books about them? Or spend our lives to defend them? 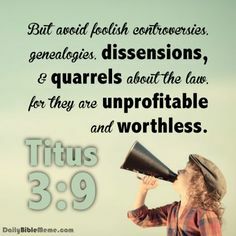 No, the Bible is clear when it says, “Avoid foolish controversies.” The operative word there is foolish. Certainly, Christians are called to “contend for the faith once for all delivered to the saints.” But much of what Christians argue about is foolish, has no merit and is based purely on speculation. There is no clear biblical teaching on foolish controversies, but many insist on studying them, writing about them and worst of all, dividing over them. That’s why they are dangerous. A foolish controversy that I haven’t heard lately but was popular years ago is the argument that Jesus’ garment at the cross, for which the soldiers cast lots, was very expensive. We have absolutely no evidence to suggest that, but this contention has been used as a proof text to suggest that Jesus was prosperous and we should be as well. Another foolish controversy, one very much present today, is that Jesus was really crucified on Wednesday and rose from the dead on Saturday. Therefore, the argument goes, we should gather for worship on that day, not on Sunday. Again, there is no biblical support for that argument. It creates heat, but provides no light. Remember, the main things are the plain things and the plain things are the main things. As I pondered these matters last week during a long run, it occurred to me that sometimes good people leave a good church because of foolish controversies. For example, is there a biblical case to be made for someone leaving a church because the church doesn’t just sing hymns? Is there a biblical case to be made for someone leaving a church because the church celebrates Christmas? Or meets in a building? Or doesn’t have Sunday School? Even more foolish, is there biblical support for leaving a church because the carpet is green instead of red? Or because the church has a steeple … or does not? The sad truth is that when we embrace foolish controversies, which cannot be proved through Scripture, we don’t just become dangerous to ourselves spiritually. 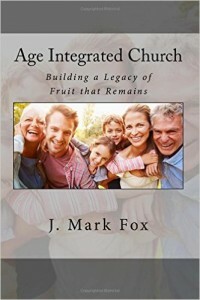 We may also become divisive in the body of Christ. One way to avoid foolish controversies, as Spurgeon suggests, is to become intentional about pursuing good works. We should find no controversy there. Great post and great points. Too many of us do spend far too much time discussion issues that aren’t really important. Problem is that the unsaved see this and probably find it off-putting.